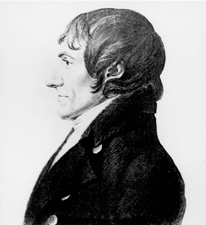 PLUMER, William, (father of William Plumer, Jr.), a Senator from New Hampshire; born in Newburyport, Mass., June 25, 1759; moved with his parents to Epping, N.H., in 1768; completed preparatory studies; Baptist exhorter; studied law; was admitted to the bar in 1787 and commenced practice in Epping, N.H.; held various local offices; member, State house of representatives 1785-1786, 1788, 1790-1791, 1797-1800, and served as speaker in 1791 and 1797; member of the State constitutional conventions in 1791 and 1792; elected as a Federalist to the United States Senate to fill the vacancy caused by the resignation of James Sheafe and served from June 17, 1802, to March 3, 1807; was not a candidate for reelection; member, State senate 1810-1811, and chosen president of that body in both years; elected as a Jeffersonian Republican to be Governor of New Hampshire 1812-1813, 1816-1819; presidential elector on the Democratic ticket in 1820; retired from public life and engaged in literary pursuits; one of the founders and the first president of the New Hampshire Historical Society; died in Epping, Rockingham County, N.H., December 22, 1850; interment in the family burial ground on his estate near Epping, N.H.
American National Biography; Dictionary of American Biography; Plumer, William. William Plumers Memorandum of Proceedings in the United States Senate, 1803-1807. Edited by Everett Brown. 1923. Reprint. New York: Da Capo Press, 1969; Turner, Lynn. William Plummer of New Hampshire, 1759-1850. Chapel Hill: University of North Carolina Press, 1962.